The bitter orange trees are almost ready to harvest. When we bought our little house last year, the two trees near the end of the driveway were welcome mostly because they block the view of a metal building next door. At the time, the fruit on them looked petrified, thanks to drought, wretched heat and no attention. This summer, with decent rains, they looked edible. We thought they were big, fat limes. They had that elongated shape and tasted vaguely like limes, only with a lot of seed. Then our friend Jean Shoup came for a visit. Not limes, she said. Lime trees freeze here. Those are bitter oranges. She said they’d make good marmalade. A few days later, a young painter from Nicaragua was here to do some work on our walls. He noticed the trees and asked if he could come back when he wasn’t feeling well. He said his family uses the leaves to help alleviate headaches and indigestion. That gives some meaning to the idea of a “bitter pill,” doesn’t it? Almost ripe; just a hint of green still in them. Citrus aurantium, also known as the bigarade, sour or Seville orange, is native to southeastern Asia but it’s been distributed around the world since at least the 9th century, when it found its way to the Middle East. By the end of the 12th century, it was being cultivated in Seville, Spain, and it was reportedly the only orange grown in Europe for about 500 years. 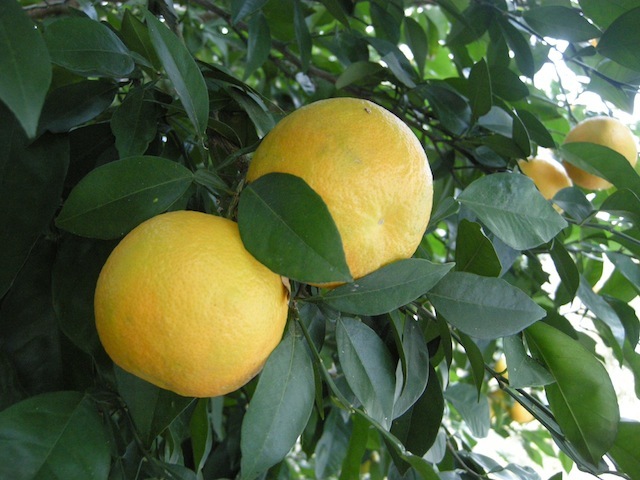 Spaniards brought it to Florida, and by the late 18th century, sour oranges were exported from there to England – where, indeed, they were used to make marmalade. 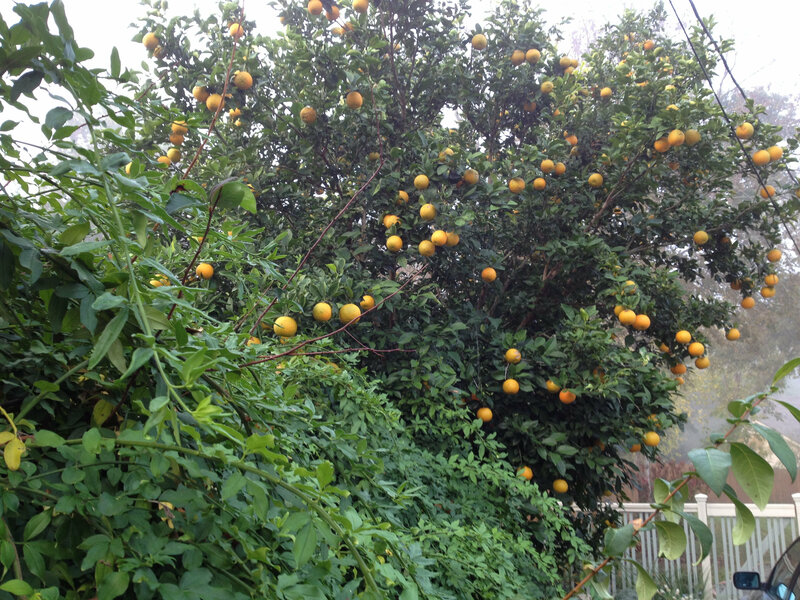 Known for their survival abilities, some bitter orange trees have been known to live for centuries. There are more than 20 forms, and sour oranges have naturalized from Florida to Mexico, among other places. I have no idea which one ours is. The neighbor we share them with thought it was odd that the gentleman who planted them put them right on the property line. They do make a fine screen. Bitter orange has various culinary uses and apparently makes a good vinegar. Oil from the peel is used to make flavorings, and the flowers (whose fragrance we inhaled ast spring) yield neroli oil, another raw material for flavoring that’s also used in fragrances. Sour orange is also a medicinal plant in several cultures – as our painting friend suggested – but it can have very serious side effects, speeding the heart rate and raising blood pressure, so we won’t be doing any health science experiments here. But stay tuned for the great 2012 marmalade experiment. This entry was posted in Garden and tagged Bitter Orange on November 27, 2012 by Molly Glentzer.